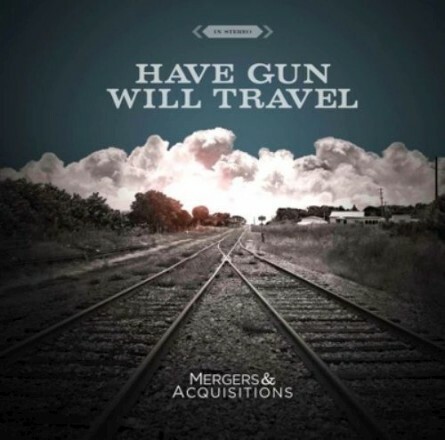 Have Gun Will Travel’s third album (and first for Suburban Home), “Mergers & Acquisitions” could be the band’s most focused and best written album. The album is available on LP, CD, Digitally, and as a deluxe set. The CD and LP will come with a free HGWT beer coozie (while supplies last). The Deluxe Set will contain vinyl, CD, and Pint Glass. Only 100 deluxe sets will be sold. The vinyl will be pressed on 2 colors (300 on green, 300on blue) and will come with a Download coupon. 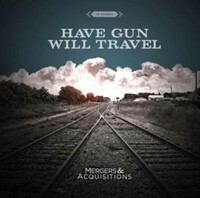 I first heard Have Gun Will Travel after the Takers played a few shows with them. Bryan from Nine Bullets also sung their praises and sent me a copy of their last album. We adopted the band when they self-released “Postcards from a Friendly City”, an album I just fell in love with. I first met all the guys when they played Nine Bullets Anniversary Party last year and invited them to play some shows in Colorado after South by Southwest. We had a really great time and during that Colorado stretch, we discussed the possibility of putting out their next album. The band recorded much of “Mergers & Acquisitions” at their practice space. Other parts of the album were recorded with Andy Feldman who co-produced the album with Have Gun Will Travel. Scott Anderson (of HGWT) mixed the album. Steve Connelly mastered the record. The artwork for the album was done by Janell Francois with photography by Kelley Jackson. Devon Stuart of the Takers makes a guest appearance on the record on the song, “Thirteen Miles to Empty”. Having had some time to spend with the record, I can easily say that fans of “Postcards” are going to love this album.